In the aftermath of this year’s Oscar nominations and its unforgiving whittling of a slate of contenders down to a handful of frontrunners, St. Vincent now seems like a curious outlier. A festival favourite backed by the Weinstein Company, starring three prior Oscar nominees, and presenting a story that derives humour and emotionalism from potentially heavy subject matter, St. Vincent would seem a shoo-in for more awards consideration than it has attracted. Instead, the film is largely absent from theatres as of this writing, having earned decent box-office, a muted critical reception, and a modicum of awards traction. What happened? The film’s tepid reception might be the result of over-familiarity with this type of story and its self-consciously ‘indie’ handling. 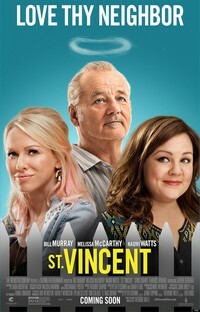 St. Vincent concerns the eponymous (not so saintly) Vincent, played by Bill Murray, a reckless, heavy-drinking curmudgeon. Vincent unexpectedly and reluctantly takes on the role of babysitter to the son of his new neighbour, single-mother Maggie (Melissa McCarthy) and a series of life lessons for both the boy (Jaeden Lieberher), his mother, and Vincent almost inevitably ensue. Certainly, St. Vincent wears its clichés unabashedly; the redemptive arc of the grouchy, un-PC but warm-hearted protagonist is carried out to the extent of canonization after all, and the ‘toughening-up’ of the bullied boy under the elder man’s tutelage presents virtually nothing we haven’t seen before. The impulse towards safeness and sentimentality is not helped by an over-emphatic score, an unseasonably sunny and colourful depiction of New York and its capital C ‘Characters’, and a soundtrack derivative of a thousand other indie dramedies. But this is counterbalanced by the film’s readiness to venture into heavily dramatic territory, its later shifts into seriousness muddling the viewer’s early perception of utter predictability. Broad comedy sits often uneasily alongside near-tragedy, and the unrelenting harshness of economic recession underlies (to a point) nearly every narrative development. The film’s much-noted ‘failures’ to resolve several of its narrative threads, or sufficiently soften the less likable edges of its characters, are actually (inadvertent?) virtues, capturing some of the messiness of life in a manner entirely at odds with the film’s self-positioning as easily digestible and mainstream accessible. This combating of the predictable and sentimental is aided by some very good performances. Bill Murray, ever-entertaining, plays to type effectively, evading sentimentality and capturing the facets of a not-uncomplicated character. McCarthy largely eschews her usual broadness and gives a lovely portrayal of a struggling single mother. Naomi Watts plays Daka, Vincent’s foul-mouthed pregnant Russian prostitute/girlfriend, and clearly relishes a rare comedic role; she plays up the ridiculousness of her character while also - occasionally - reining herself in for smaller moments. And Jaeden Lieberher as Oliver is that rare child actor who overcomes the precious precociousness with which the role of the sensitive, preternaturally wise child could have been played. Ultimately, St. Vincent is the uncommon and unfashionable film that speaks to a compassionate and tolerant worldview, most clearly evidenced in the diverse, utopian classroom of Oliver’s Catholic school teacher Brother Geraghty (Chris O’Dowd). Again, this often devolves into cliché - the convention of the quirky, mismatched, but ultimately loving surrogate family rears its head - but the triteness is countered by just how concerted the film’s efforts are to humanize and understand its characters, ushering in a complexity that the quirky framing cannot quite contain. Always warm and often funny, St. Vincent is a more interesting film than it appears to be on first glance. This review was published on January 21, 2015.